Did you know the average cost of hire is $4,200? That 45 percent of a recruiter’s time is spent filling jobs due to attrition? That last year it was averaging 50 days to fill a job, any job? And that about a quarter of recruiters say it takes them more than two months to fill? If recruiters like you hadn’t taken 10 minutes to complete ERE Media’s 2015 State of Talent Acquisition survey, you wouldn’t know that. Not from us and not for free. Nor would we be able to show you how recruiting workloads break down (average is 100 hires annually per recruiter), or any of the dozens of other data points so critical to understanding how you, your team, and the TA group as a whole compare to others. 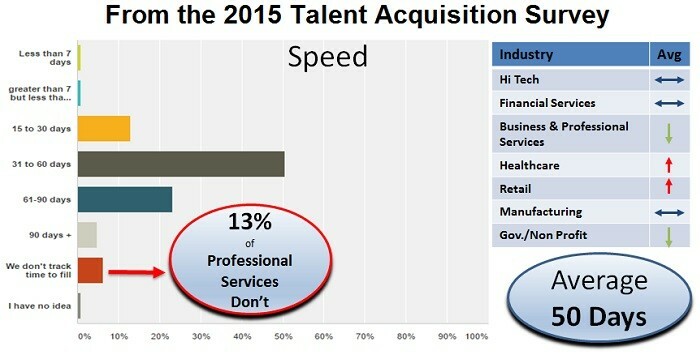 Now we need another 10 minutes of your time to take our 2016 Talent Acquisition survey. This year’s survey is especially important because it will give us three years of data to examine so we can let you know what’s trending in talent acquisition. We’ll release the results at the upcoming ERE Recruiting Conference in Las Vegas (April 6-8), which, appropriately enough, will focus on how data can improve your talent acquisition program. Everyone who completes the survey can also have us email you the key summary results. And we’ll be reporting the results here on ERE.